30 Things You Might Not Know About "Beauty And The Beast"
This "tale as old as time" shares a connection with both Jackie Chan and Animaniacs. 1. Walt Disney attempted to develop Beauty and the Beast into an animated film both in the 1930s and 1950s, but ultimately gave up because the writers found the story too difficult to adapt. 2. The song "Human Again" was cut just before production started. The song was later added to the Broadway show and was recorded and animated for the 2002 re-release of the film. 3. Disney borrowed ideas from Jean Cocteau’s 1946 live-action film. The classic French film included the idea of rival suitor for Belle named Avenant, who tries to kill the Beast upon learning that she loves him, losing his life in the process. Also, the film included the household objects in the Beast's castle coming to life. Then-Disney Chairman Jeffrey Katzenberg scrapped this version of the film after seeing the initial story reels in 1989. Purdum resigned shortly after, when the decision was made by producers to adapt the story into a musical. 5. After Purdom left the film, screenwriter Linda Woolverton was hired to rewrite the script. Her only writing experience with Disney had been writing a few episodes of Chip 'n' Dale Rescue Rangers. Woolverton went on to cowrite The Lion King and Mulan, and write Tim Burton’s Alice in Wonderland. 6. Katharine Hepburn's portrayal of Jo March in the 1933 film adaption of Little Women inspired the characterization of Belle. Woolverton used Hepburn's performance as inspiration because she wanted to make a Belle a stronger, more independent character. 7. Belle is the only person in her village who wears blue, which is meant to symbolize how different she is from everyone else. 8. 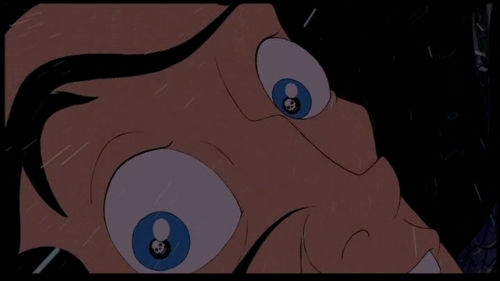 When Gaston is falling at the very end, a tiny skull flashes in each of his eyes during a close-up of his face. This is meant to symbolize that he does indeed die. 9. Julie Andrews was the reportedly the first choice to voice Mrs. Potts. 10. Originally, Chip had only one line in the entire film, but the producers liked Bradley Pierce's voice work so much that they expanded the character. 11. Before Chip’s character was expanded, the original “cute” character was intended to be a music box. The music box character was inspired by Dopey from Snow White and the Seven Dwarfs, and could only communicate through chiming musical notes. 12. Bambi’s mother makes an appearance in the movie. In the opening shot of the film she can be seen drinking from the stream in the lower right. 13. The song "Be Our Guest" was originally supposed to be sung to Maurice instead of Belle. 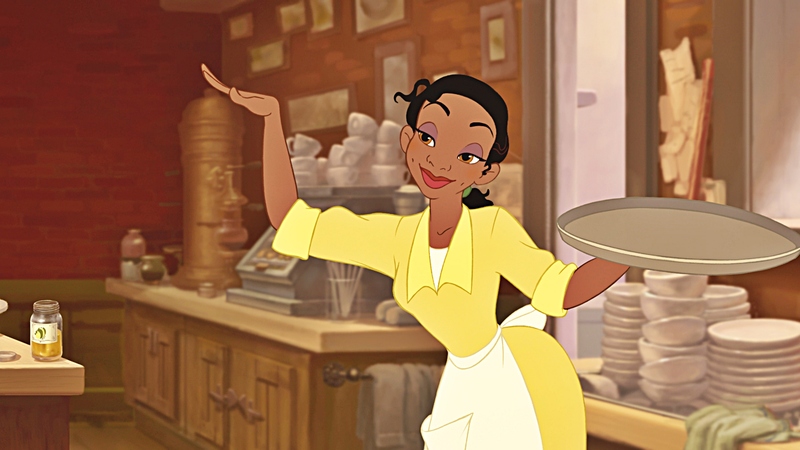 The scene was rewritten to include Belle in the song, as producers felt the song was too good to waste on secondary character Maurice. 14. The character of Cogsworth was written specifically with John Cleese in mind, but he turned down the role. 15. Angela Lansbury, the voice of Mrs. Potts, did not think she was suited to sing the ballad “Beauty and the Beast.” She recorded one take at the director’s request, to have for a back up if nothing else worked, and that one recording ended up in the film. 16. 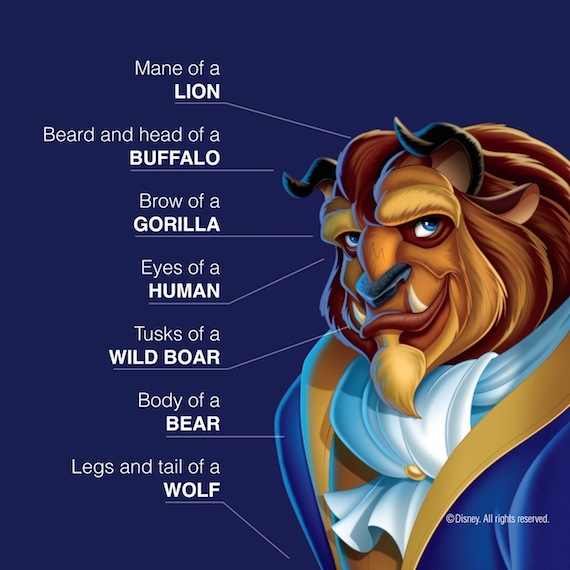 Animator Glen Keane based the Beast's appearance on a several animals, drawing inspiration from the mane of a lion, head of a buffalo, brow of a gorilla, tusks of a wild boar, legs and tail of a wolf, and the body of a bear. 17. Beauty and the Beast was the second Disney film produced (and “first prestige film”) to use CAPS (Computer Animation Production System), a software developed for Disney by Pixar. The software allowed Disney to create the iconic ballroom scene. The first Disney movie to use CAPS was The Rescuers Down Under. 18. The finale dance between Belle and the Prince is actually reused animation from the finale dance between Princess Aurora and Prince Phillip in Sleeping Beauty. This sequence was reportedly reused because animators were running out of time during the production of the movie. 19. Paige O'Hara, who provided the voice for Belle, sobbed real tears while recording death of the Beast scene. 20. Disney originally wanted Jodi Benson, the voice of Ariel in The Little Mermaid, to provide the voice for Belle. 21. The prince’s name is Adam, but it is never mentioned in the movie. The name was later confirmed by the CD-ROM tie-in game and the Broadway musical. 22. One scene that was storyboarded, but never animated, was a scene where the Beast is seen dragging the carcass of an animal he killed. The scene was considered too dark and gruesome for the film and was dropped. 23. In the original draft of the film, Gaston was supposed to be killed by wolves after surviving his fall from the Beast's castle. This plot point was later reused for Scar’s death in The Lion King. 24. Some of the sculptures seen in the castle are early concept versions of the Beast. 25. Sherri Stoner, who served as the animation reference model for Belle and also Ariel in The Little Mermaid, went on to create and voice Slappy Squirrel on Animaniacs. 26. Jackie Chan performed the voice acting and singing for the Beast in the Chinese (Mandarin) dub of the film. 27. Belle was the second Disney princess to not be of royal descent, after Cinderella. Tiana is the third. 28. Beauty and the Beast was the first animated film to earn more than $100 million at the box office. The film was the third highest-grossing movie of 1991, behind Terminator 2: Judgment Day and Robin Hood: Prince of Thieves. 29. Beauty and the Beast was the first animated film nominated for the Academy Award for Best Picture. It lost to Silence of the Lambs. Additionally, Beauty and the Beast is the only traditionally hand-drawn film ever nominated for Best Picture. The only other animated films nominated for Best Picture are Up and Toy Story 3. 30. 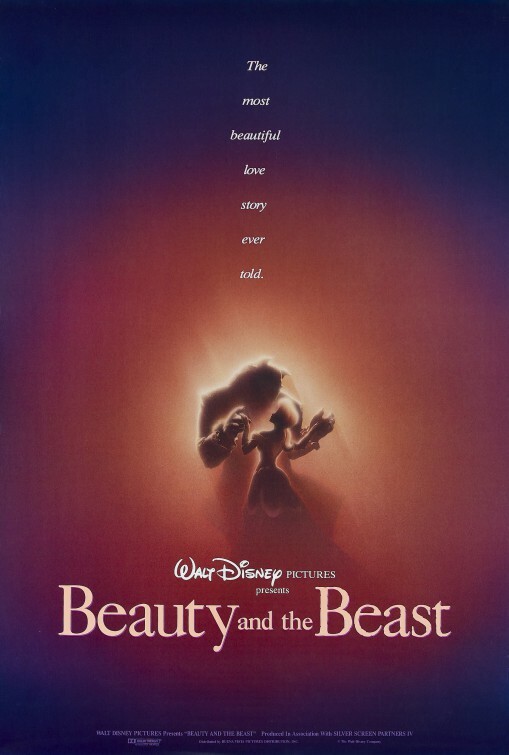 In 2002, the Library of Congress deemed Beauty and the Beast a "culturally, historically, or aesthetically significant" film and selected it for preservation in the National Film Registry. Sources: Movie Fone and IMDb.